Well, we've had a satisfyingly autumnal month, even if Newcastle did recieve a blast of snow in the last few days. I think this is the first year that I've really been able to appreciate the changing of the leaves and their contrast with a gorgeous blue sky - in previous years I've either been drenched in rain (in Plymouth) or too cold to notice (particularly last year, when winter hit within the first fortnight of October.) Whatever the weather, though, there is always time for cake, and if that cake contains some warming tipple then all the better! This month, in honour of Oktoberfest, I asked you to spike your baked goods with beer. I was a bit nervous when it got to the middle of the month and I'd only had two entries, but I shouldn't have worried because I recieved several more afterwards. Let's dive in, shall we? ...Or indeed in a good cake, as Caroline shows us with her second Baking With Spirit entry, Nigella's Chocolate Guinness Cake. It sounds incredibly moist and delicious, and I bet the cream cheese icing works brilliantly with it. Charlene at Food, Glorious Food made this Sticky Ginger & Guinness Cake with Fudge Icing for her Grandad's birthday. I love ginger cake and the fudge icing must really enhance the stickiness of the sponge. I've never made ginger cake before so I may have to try out this recipe some time. Next up we have my entry: Pineapple Upside Down Loaf Cake. I spiked the batter with some Newcastle Brown Ale, which married nicely with the sweetness of the sugar syrup on top. Highly recommended. Mel at Sharky Oven Gloves isn't a big beer fan either, but luckily, like me, she enjoys it in baked goods. 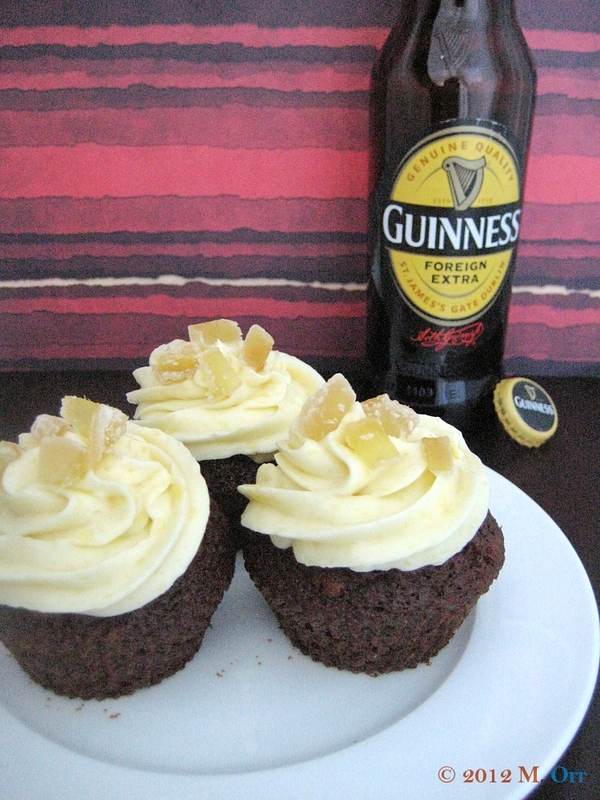 Her Guinness Gingerbread Cupcakes look divine, especially with that cream cheese icing. Ginger and guinness are obviously a good combination - I have clearly been missing out! Ros at The More Than Occasional Baker made these Spiced Apple, Honey And Beer Cakes. She used apple beer from Belgium, which sounds appealing to me even if it is beer. The cakes are vegan to boot, and though Ros says she wasn't a fan they sound good to me. I love how she tied them up with a little bow, too. Many thanks to those of you who took part in the challenge this month, and for those of you who ran out of time or were too nervous to try it, perhaps you'll be more tempted by next month's theme. I'll be posting the new challenge on Thursday, so keep your eyes peeled. I made a rather rich and indulgent (even with low fat ingredients) cheesecake over the weekend, so look out for it when I post the recipe in the next couple of days. Hi Janine! Glad you found our website and you're looks amazing...When I have bit more time I'm going to have such fun exploring! :) I only have one ?? about your spirit of the month: can be submit recipes that we've baked prior to that month or would you like us to bake with that spirit in that particular month? As you know, we have a recipe box just ready. :) Cheers! I'd say it's fine to use old recipes if you want, though new ones are always welcome! Looking forward to your entry next month. Hi Janine! 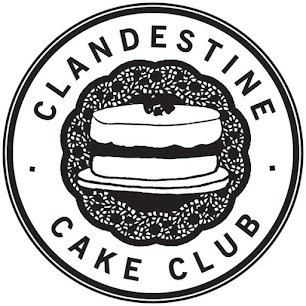 This is Jacqueline, also from Bake It With Booze :) Thank you for visiting our website. 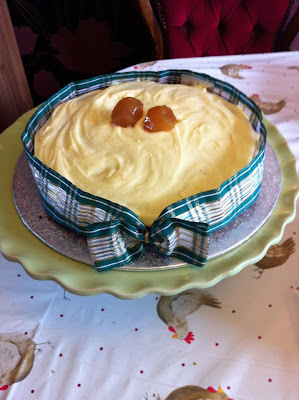 I'm excited about your monthly "Baking With Spirit" roundup - what fun! Thanks Jaqueline, I hope you can take part!